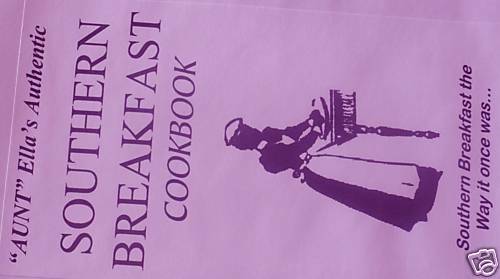 A beautiful 40 page cookbook that has the best that Southern breakfast can offer......the way it once was! A highlight of the book from the editor says, "
This cookbook follows a beautiful story of a woman that lived for cooking through the love of her family. Never to let her family go hungry in tough times, she even made extra for the other kids in the neighborhood. Her gift for cooking catches the attention of a "well to do" business who owned several businesses, including a bed and breakfast. As fate would have it, his son raided her kitchen being that he was a close friend of this cooking mom. Throughout the years she eventually cooked for his family, gaining employment for life. Ella passed away in 1986 at the ripe old age of 88 - BUT HER RECIPES LIVE ON in the very book you are holding in your hands! She was very proud of her recipe collection - and these recipes did make an awful lot of people very, very happy for so many decades. She specialized in Breakfast recipes and we've got them ALL right here. A very special thanks goes out to Ella's great-granddaughter Carmen for the bio, and for "filling in the blanks" for us! The staff at Solar-Vision is proud to present these very unique recipes to you from the "Golden age" of Southern Cooking... the way it ONCE WAS!